The location was perfect because it wasn't too far from 'the action of the French Quarter,' but at the same time you can get away from it. Also, convenient to the Convention Center. The only problem was that the construction made it extremely difficult to get to it. It's ridiculous! Good location. Friendly staff. Sheets on pull out couch were dirty with hair all over them. Had to have replacements sent up to room. The hotel valet was difficult to find. I drove around the area twice and made two calls with the hotel to find the valet area. I ended up illegally parking my car and walking inside the hotel where they called the valet person. It took them 15 minutes to show up. Valet was $40, an unexpected cost and the only parking option. I woke up to construction machines at 4:53 am and I could hear people outside my room. The middle of the hotel is open so I could easily hear people on the other floors that we’re talking. I will not be staying here again. The perfect place right in the smack middle of everything.. will definitely be back . Great location; friendly staff; great room...construction on the street and in the lobby detracted some from the overall experience. Nice. They were remodeling so it took away from a lot. did not like the fact there was no Parking but other than that it was a great experience. Hotel was comfortable and staff was great. Great location. Best hotel I stayed at on my 2 week trip across the country. The staff was awesome about suggesting places to visit and helping me navigate a new city. Highly recommend this place to anyone. Great, convenient location with all the amenities. Breakfast was very good. The staff at the front desk is stellar. Convenient and within walking distance of many NOLA sites. The Staff where really great!! Dominique was the one who helped us check in. She was super friendly and even helped us check in earlier then expected. Candy was also wonderful, she always had a smile on her and made you feel like home. There rooms were nice a little "old" you can tell by the bathroom because of the water stains but they are in the middle of renovations (at least in the lobby). Honestly it wasn't to bad, it was super close to the Riverwalk outlet and only a trolly ride away to the french quarter, bourbon street. We only stayed one night because we just came back from a cruise but I wouldn't mind staying again! Had a very bad experience. Picked this hotel out due to the reviews but was hoodwinked by the area of the hotel. We drove my daughter down for college in her brand new truck which was a gift for her graduation from HS. We parked the truck in Valet and valet parked her truck on the corner of the hotel. We could not move her on campus until 8am At 2am her license plates front & back was stolen off of her vehicle. The hotel only response was sorry this has never happen before. And than they still charged us $35 for valet parking. So now my daughter has no plates on her truck in New Orleans until we can get back to Wisconsin to send her plates. This was such a inconvenience on the hotel part especially after we paid. There was no remorse or sympathy from the staff. Worse experience ever. Located in Lower Garden District, Hyatt Place New Orleans Convention Center is within a 5-minute walk of popular attractions such as Ernest N. Morial Convention Center and Julia Street Cruise Terminal. This 170-room, 3-star hotel welcomes guests with conveniences like a bar/lounge, a coffee shop/café, and a fitness center. For your convenience, a buffet breakfast is served for a fee on weekdays from 6:30 AM to 9:00 AM and on weekends from 7:00 AM to 10:00 AM. Entertain your taste buds with a beverage at the bar/lounge or coffee shop/café. Guests can expect to find 42-inch a flat-screen TV with cable channels and pay movies. Beds are dressed in premium bedding and the bathroom offers a soaking tub, a hydromassage showerhead, a hair dryer, and designer toiletries. Other standard amenities include a sofa bed, a refrigerator, and a coffee maker. 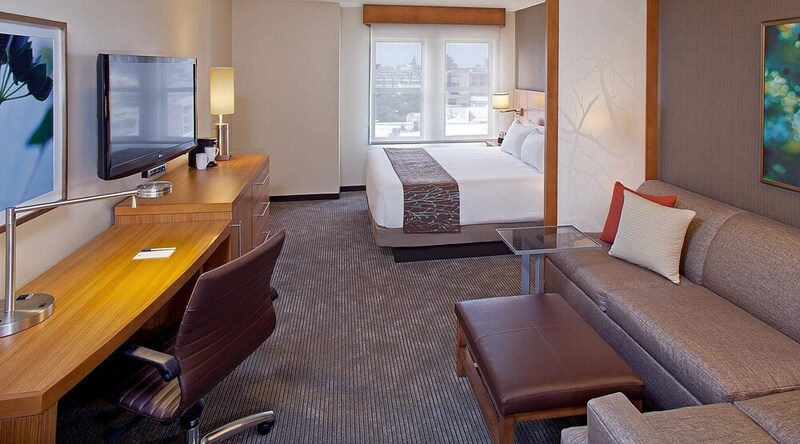 Hyatt Place New Orleans Convention Center features a fitness center, free WiFi in public areas, and a business center. Valet parking is offered for USD 35.00 per night. The front desk has multilingual staff on hand 24/7 to help with dry cleaning/laundry, securing valuables, and luggage storage. Additional amenities include a computer station, express check-out, and laundry facilities. While we are sprucing up our lobby we apologize for any inconvenience caused to you. We are confident once complete will enhanced the overall experience. We appreciate you letting us know. Buffet breakfast is served on weekdays from 6:30 AM to 9:00 AM and on weekends from 7:00 AM to 10:00 AM for a fee. Recreation features at Hyatt Place New Orleans Convention Center include a fitness center.